While David and I are certainly focused on getting everything ready for Little Lady June and her impending arrival (y'all, can you still believe I'm having a girl?! It still sound crazy to me! 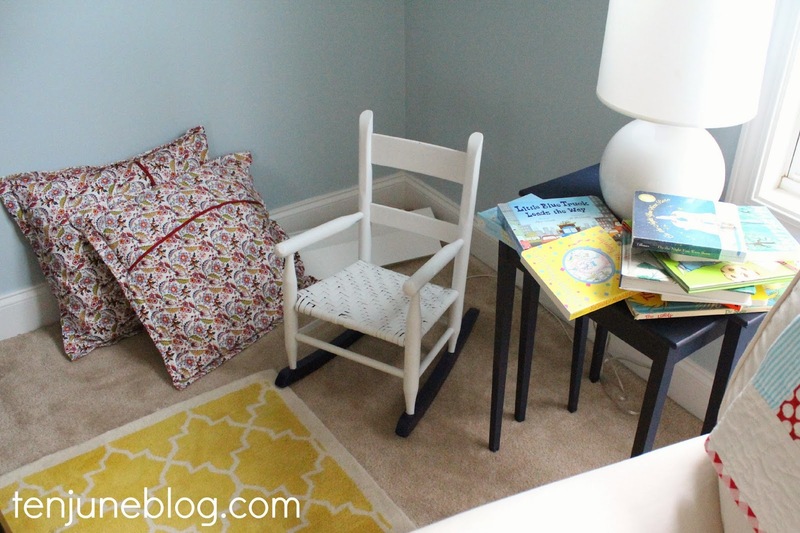 ), we have also focused on making sure HDawg's nursery is feeling comfortable, too. Wait... at 17 months old, is H's room still considered a nursery? Do I have two nurseries in my house? Wowzers. That's a #twoundertwoproblems hash tag waiting to happen! Aaaanyways. Y'all know how proud we were of HDawg's first nursery. We created that room with so much love and it quickly became my most favorite room I've ever designed. We enjoyed this room for about six months before we moved into our first rental home. H's room in our first rental house was really comfortable, but we definitely didn't spend any time setting up permanent elements, like painting the walls. But the rental house we're in now is a bit different. We want this house to feel like home, not like a temporary place to live. We plan to be here for at least a year, possibly two years, so we're okay with investing a little bit of time and moolah to make this house feel like home sweet home. 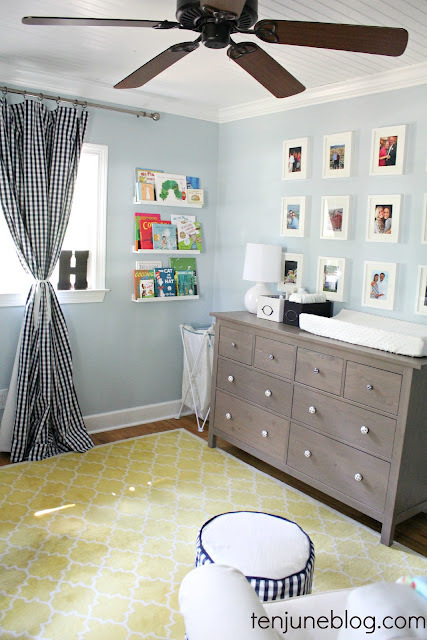 With that said, I really wanted to make HDawg's nursery here (his THIRD bedroom in his life which sounds crazy!) feel like his first room, the room we loved so much and were sad to leave behind. 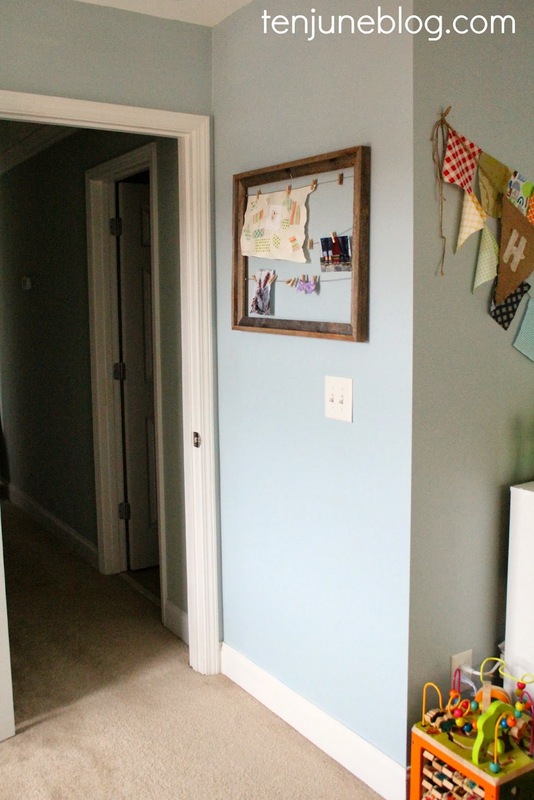 We recently painted the walls with the perfect baby boy blue paint and swapped out his crib with a new crib. 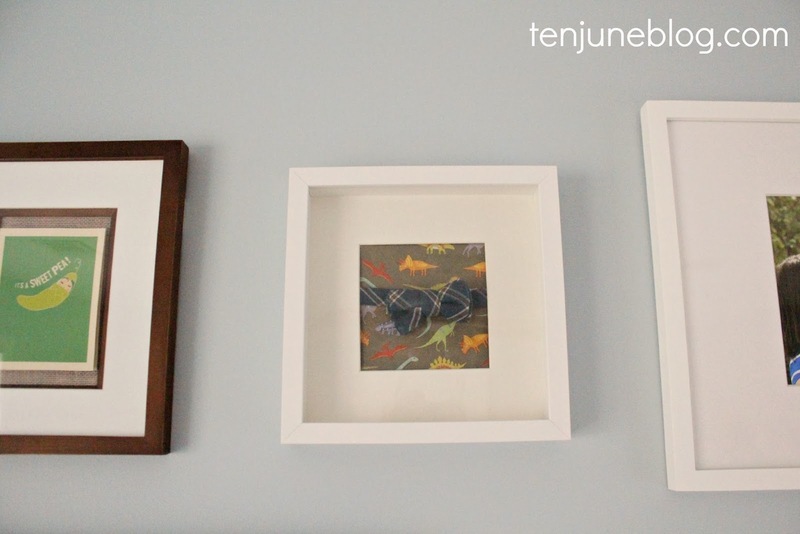 When we were snowed in a couple of weeks ago, David and I finally hung little H's art on the walls. It's really feeling like home in there! I also added this little bow tie and dinosaur paper (dinosaurs are currently H's favorite animal) to the Ikea shadowbox. If you remember, I had previously framed his old tiny Toms shoe that we used to make the announcement that I was pregnant with him. But now that shoe gets passed on to little sis, so one of his old bow ties went in the frame instead. Yes, he has "old" bow ties. And "new" bow ties. Seriously, the dapper little kid has quite the bow tie collection. 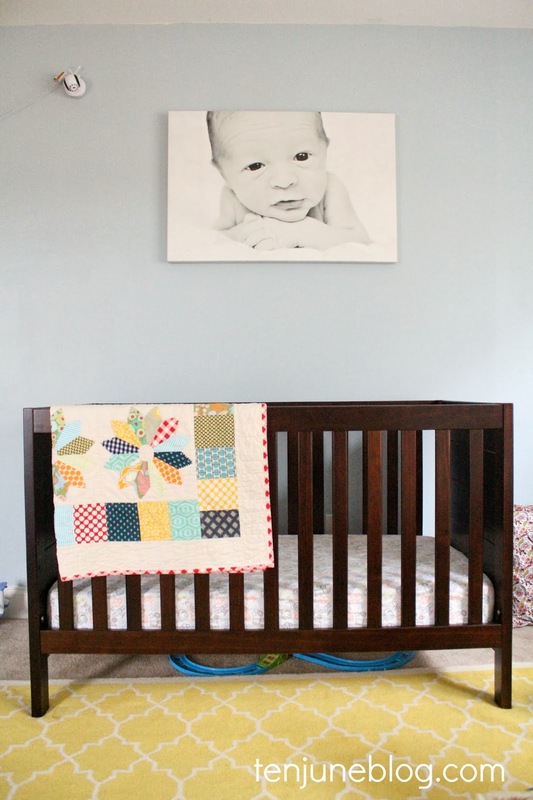 I hung our giant Shutterfly canvas above his crib because where else do you hang an adorable, huge canvas print of your sweet baby as a newborn?! The piece is hung awkwardly high for obvious safety reasons. Gotta keep those wandering toddler hands from pulling the hanging canvas down! 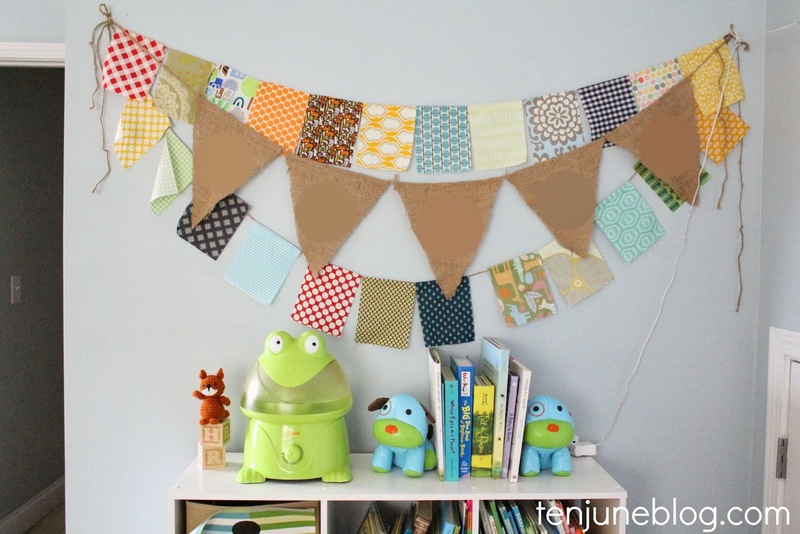 Over by his toy storage bookcase, I layered a few scrap fabric banners on the wall. I still need to organize the rest of the bookshelf. In a sad turn of events, you'll see that my fabric canvas bin makeover hasn't withstood those crazy toddler hands. I plan to update them and post about it eventually! It's definitely looking a whole lot better than when we first moved in, right? I still need to create a reading nook in this corner. I figure we'll attack that once we move the glider out of the room and into Little Lady June's nursery. As you can see, it's just a big pile of books right now! And I really want to find a cute, creative way to display/store his stuffed animal collection. I want them to be seen, but look organized and be accessible for him to play with. Any ideas? So that's what's going on in HDawg's room these days! I love how much it instantly felt like home once we painted the walls and got his personal art on the walls. Just a little work makes such a big difference! Hey Michelle, it looks so much better. As for the stuffed animals...have you seen a picture of a bookcase they converted into a "stuffed animal zoo"? All they did was fix bungie cords to the front of it. It makes it look like they are in a cage, keeps them from falling out, but also makes it easy to remove them for play time. 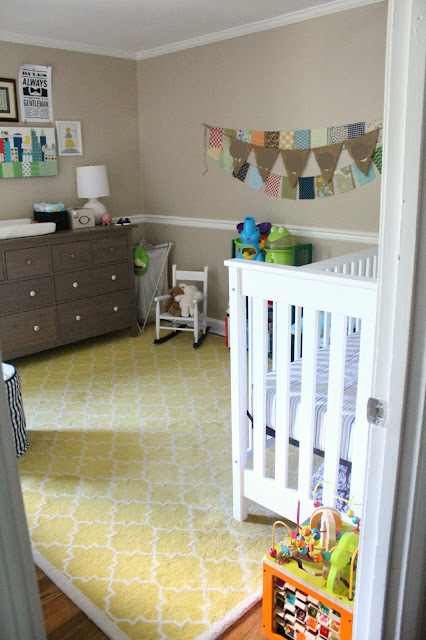 I really like his nursery! Sweet, stylish AND practical! :) Your DIY piece is my favorite. As far as the stuff animals go, I have strategically placed baskets in our play area, living room and nursery for all my daughter's "lovies". They seem to multiply all the time! It looks great! No too matchy-matchy, but just perfectly styled for a little boy! I especially love the skyline art -- might try to recreate one of San Francisco for my son, but I don't know if I'm that talented. We keep our son's stuffed animals is a 2ft lightweight, tall, woven basket. Similar to this one: http://www.decorpad.com/bookmark.htm?bookmarkId=10753, but tan and white. 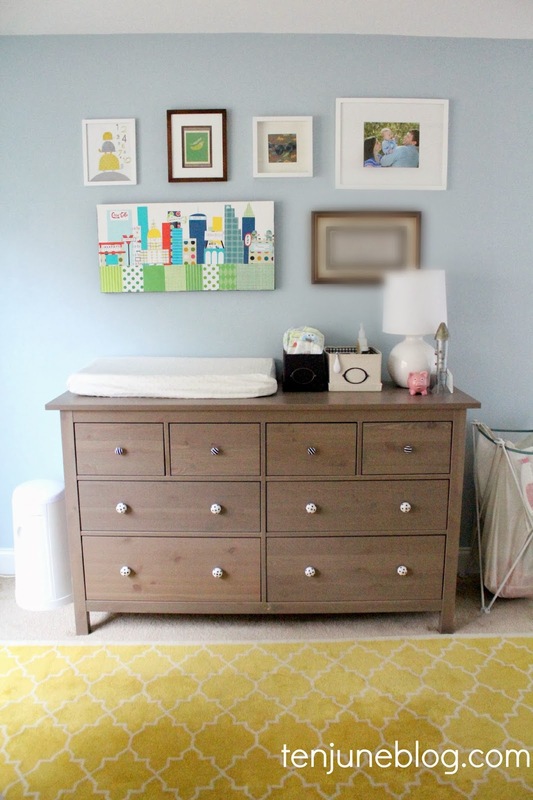 Such a sweet nursery! And I''m loving all of the artwork! We have one of those nets to hang on the wall to hold the stuffed animals. We hung it in a corner instead of on one wall. I love the gallery wall of art and the bunting so cute! I love this room! I also have a 17 month old in a rental and am feeling the inspiration to make his room more cozy and useful. Question, how did you hang your monitor? From the picture it looks like we have the same one and we have a hard time getting just the right angle from a high windowsill. Thanks! We have a Motorola monitor that has a hole in the back of it. David added one of those monster hooks to the wall and we just hooked the monitor on that! Easy peasy! : ) It's a weird angle... and the monitor looks totally weird on the wall!... but was the best we could get. 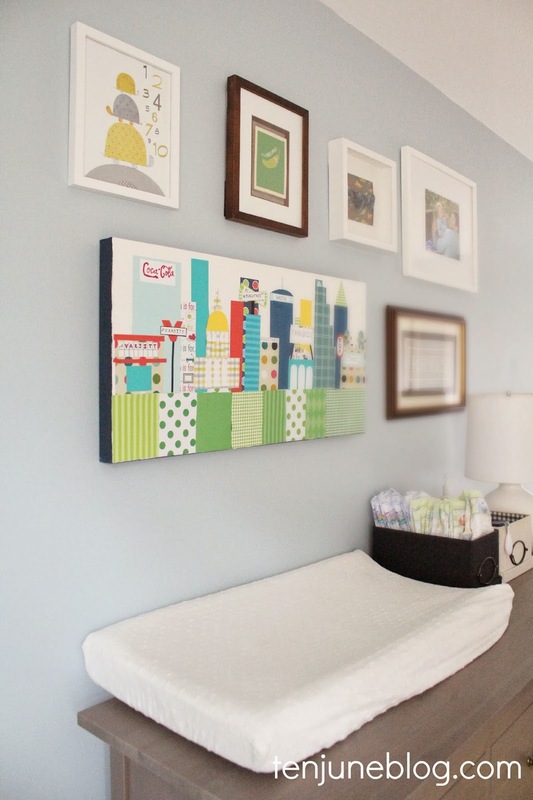 So precious - love the gallery wall! So sweet!! Bet he loves his room! What about your chevron bookcase as a home for the stuffed animals? Hoping you're hanging in there! That blue really is perfect! I love the nursery! Aw I love this! 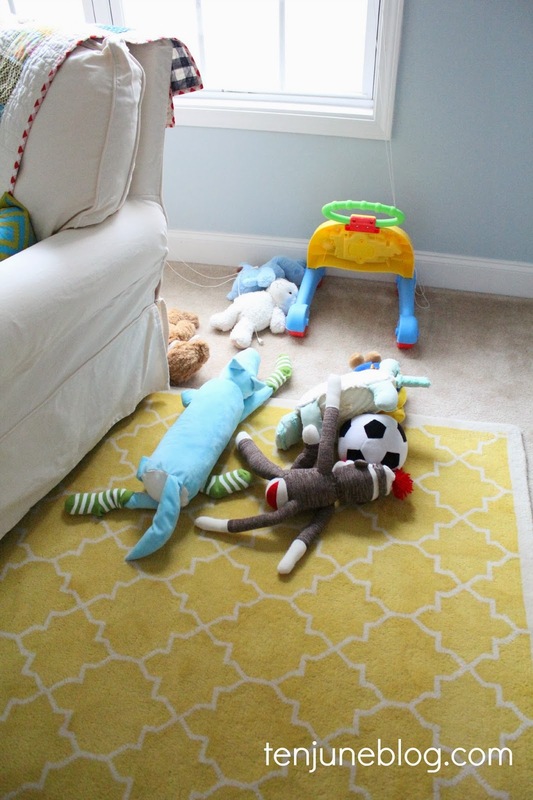 Our nursery is still a work in progress in our rental too. It's so hard to know how permanent you want to make things. Can't wait to see what else you do in his room! When we lived in Military housing, and our kids were young (they are now 29, 25, and 21!) I used a carpet roll tube that I got for free from a carpet store, covered it in wood grain contact paper (I would so paint it now with Annie Sloan Chalk Paint! ), cut it to fit the height of the room and carefully slid it into place. If you have popcorn ceilings then cut it 1 inch shorter and use small wooden blocks on the bottom to stabilize it between the floor and ceiling once it's in place. Then I screwed in small cup hooks randomly all over it. We then hung the stuffed animals all over it to resemble them climbing the tree using large rubber bands around their necks/bodies. When the kids wanted to play with them, we left the rubber band on the hook and just slid the stuffy out. 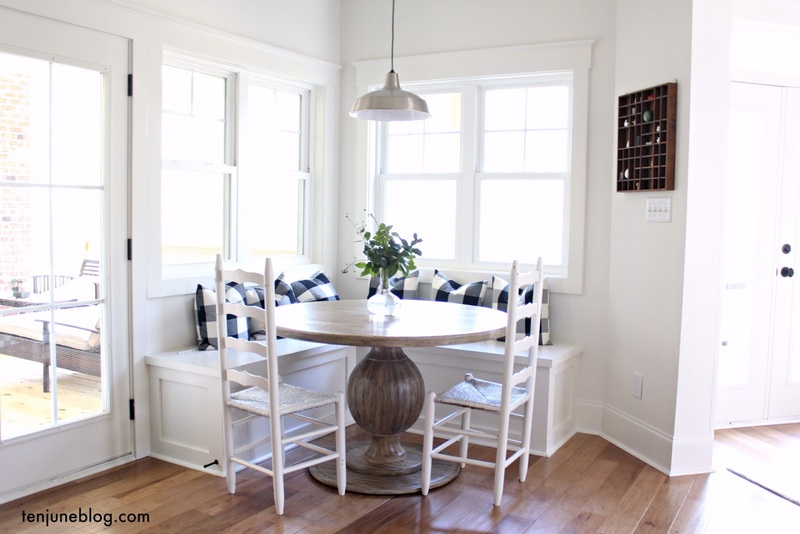 Super easy, super cute and a real space saver.